The last round of the 2017 Onza Mini Downhill winter series and the track was Ski run. Practice day was awesome, there were so many women on the track practicing. The track was slightly damp due to some rain overnight so I tried a few different lines over the rooty sections to see what worked best for me. After lunch I decided to go back up for 1 more run. 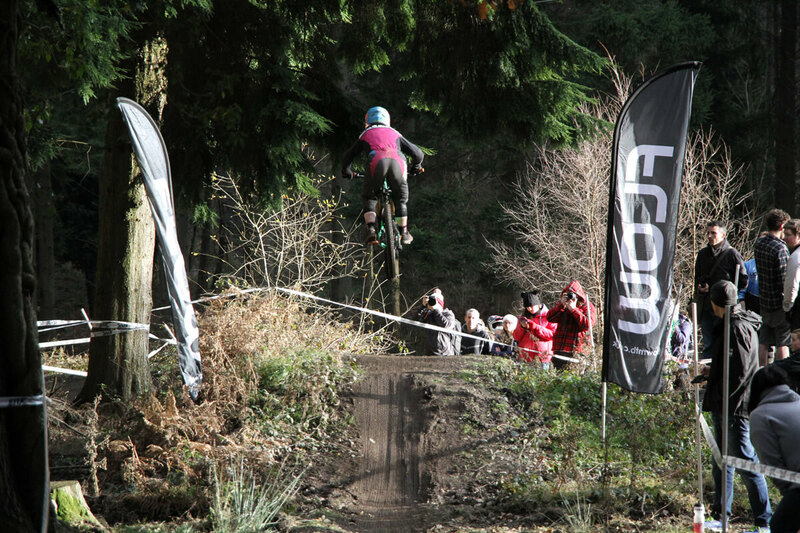 When I got to the top the course had been taped out and to my horror there was a different route on the top section. The word had spread and everyone was now making their way up to session it. The track now had a tight right hand turn instead of the straight line we had sessioned. I found it tricky at first as it was a new line but soon got the hang of it and felt as confident as I could be. The weather on race day was good. The track had dried up slightly and I was excited to get up there for a practice. I met up with quite a few of the women including my team mate Kate and headed up for a practice run. The track was running sweet. At the top the atmosphere was buzzing there were women everywhere I think around 30 of us! The women were first down the hill so I didn’t have a lot of waiting round which was good. I held back the nervous excitement and could’t wait for my first run. It went well, I remembered my line through the changed section and railed the berm to clear the hip jump then into the double and the road gap. I was in 4th position and only 1 second behind 3rd and decided there were places I could try and make up time by putting in some pedal strokes. My second run I put in pedal strokes where I could and my legs were burning by the time I reached the bottom section and I pumped like crazy into the jumps. I was pleased I had managed to go faster and knocked a second off my time but unfortunately Izzy who was in 3rd place had also gone faster and knocked 2 seconds off her time so I finished in 4th place with a time of 1.32.07.